Heated discussion among IT professionals prompts Council to elaborate on its new approach to buying software. 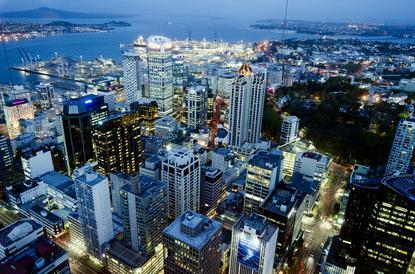 A Reseller News story about Auckland Council's new software procurement strategy provoked a heated discussion among IT professionals this month, prompting the Council to elaborate further on its new approach. The council, which spends $21 million a year on software, plans to implement three different approaches for purchasing and managing software depending on the size of the company it is dealing with and the nature of the relationship. As reported by Reseller News, it characterises the new approach, dubbed "Supplier Relationship Management" (SRM), as agile, open and collaborative. 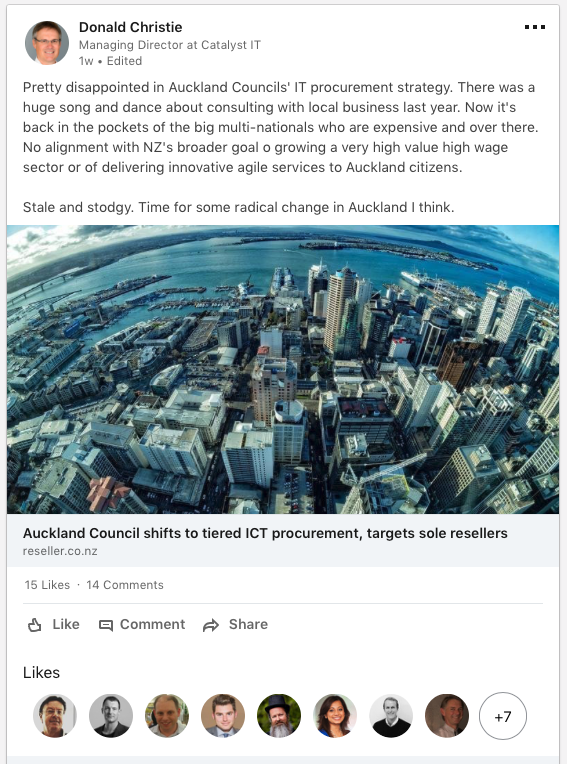 However, one local service provider responded, labelling the new strategy "stale and stodgy"
Auckland Council head of ICT and corporate procurement Aaron Donaldson, however, said the strategy articulates how Council intends to approach the market to purchase our software requirements. It does not set ICT strategic direction. “The ICT department and Procurement have recognised that the fast evolving and innovative ICT sector does not always lend itself to traditional procurement approaches," he said. "Therefore, we have called out some more flexible procurement approaches that allow for Council to best understand the breadth of solutions available and the capability of various suppliers in a face to face setting." Donaldson said the strategy also provides scope for suppliers to understand the opportunity and constructively challenge Council’s proposed approaches early in the process to ensure it procures the products and services that will provide the best outcome and value to Auckland’s ratepayers. Donaldson also addressed a new presentation slide that was not in the original deck that prompted Reseller News' coverage (see below). A new slide from Council's software procurement strategy presentation. 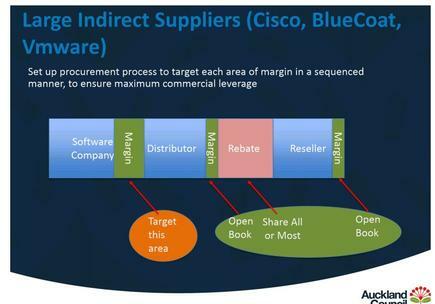 The chart specifically addresses procurement from infrastructure software providers Cisco, VMware and Bluecoat, talking about targeting each layer of margin in the supply chain. It says open book pricing would be required from resellers while Council would specifically target the software companies' margins. "In regards to our approach to margins, the point we are trying to make is that with multiple parties involved in the transaction of some software solutions, Council needs to be informed as to where the potential margins are so we can plan a procurement approach that allows us to get the best value out of the transaction," Donaldson said. Overall, the changes will affect software suppliers big and small, but four top-tier vendors - SAP, Microsoft, ServiceNow and ESRI - are singled out for special attention, according to a presentation by ICT procurement manager Stephen Horsley. Catalyst IT managing director Don Christie kicked off the debate two weeks ago posting that he was "pretty disappointed". "There was a huge song and dance about consulting with local business last year," Christie wrote. "Now it's back in the pockets of the big multi-nationals who are expensive and over there. "[There is] no alignment with NZ's broader goal of growing a very high value high wage sector or of delivering innovative agile services to Auckland citizens. "Stale and stodgy. Time for some radical change in Auckland I think." Meanwhile, experienced IT professional David Hartnell responded that councils are obligated to get the best deal under the Local Government Act. "That is often interpreted as cheaper and local companies are sometimes viewed as a bit more risky in terms of their ability to deliver large scale outcomes," Hartnell commented on LinkedIn. "Ratepayers/citizens are not open to the idea of increased risks or costs which is why our councils are not innovative or willing to support smaller NZ enterprises over the so called large and proven enterprises." Hartnell said central government sets both an example and the procurement rules that make it harder for local companies to compete against the big multinationals. Through social media, Hartnell posted quotes from the Local Government Act in support of his argument: "A local authority should ensure prudent stewardship and the efficient and effective use of its resources", he said. "A local authority must manage its revenues, expenses, assets, liabilities, investments, and general financial dealings prudently and in a manner that promotes the current and future interests of the community." In addition, Drew Broadley, who has worked both in government and start-ups, said improving procurement inside of government wasn't easy but can be done. "It requires months of building trust with the procurement team that often get left to the last part," he added. "It takes a lot of effort to research legislation to understand the principles and values of procurement inside of government." The "go to" vendor other agencies use will be considered because, firstly, the challenges of procurement have made it easier and, secondly, because they have been through the process and been signed off before. On top of that the project culture in government still favours vendors considered "safe" over smaller players. "This comes down to internal delivery models that define having to commit your whole project budget on the chance a vendor will work," he said. Some selection team members often won't be willing to opt for the less known vendor, forcing the lead manager to justify with evidence why the name vendor wasn't selected - something that can cause a "chain reaction". Continuing the conversation, Ben Marris, CEO of New Zealand Leaders, which connects people in government and industry with mid-sized entrepreneurial companies, said New Zealand tech firms are having more success with councils across Australia as opposed to locally because they are "focused on effective and efficient community engagement rather than organisational consolidation." "Feels like this council is driving with its eyes on the rear vision mirror," Marris concluded. The software procurement strategy was just one part of Council's new approach to purchasing. A hardware strategy is also being prepared as is a plan for engaging the market for technology services such as cloud, data centre services, print and network services. New plans for changes to professional services and professional technical services procurement are also expected.